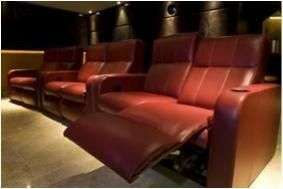 Fortress cinema seating makes itself comfortable in the UK | What Hi-Fi? There are even versions fitted with the D-Box motion system, which will move the seat in synchronisation with the on-screen action, driven by a programmed track on the movie. The seats are available in leather, half leather or to order using the customer's own choice of leather or fabric, and all models use a birch plywood and alder frame, metal-to-metal fixings and a commercial-grade steel mechanism. Designs start with the £1550 California, and come in a variety of contemporary and retro styles. Electric recliner upgrades start from £500, while the D-Box system will add around £10,000 per seat. All designs can be customised to the buyer's own requirements.